EMKA's new IP65 compression wing knob latches are increasingly popular for cabinets and enclosures of all types – whether for their anti-vibrational characteristics, or for superior sealing. The wing knob design makes it suitable for a large number of low access security, high sealing protection roles where ingress of dust and water is a problem. 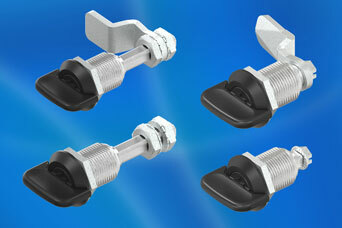 This new latch comes in 2 types, each with a full 6 mm pull-down. The basic form is adjustable only by use of different cams – its’ companion however provides extra depth adjustment with a threaded rod which considerably extends the reach to match extra deep doors or frames.